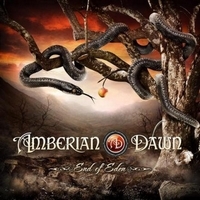 Amberian Dawn are working really hart, with End Of Eden they release their 3rd album in about 2 years. The Finnish band with singer Heidi Parviainen is presenting symphonic power metal - the way we all know it from Nightwish with Tarja Turunen. She even sounds like her famous colleague and she's spot-on. They focus on keyboard-laden tunes which sound a bit too cool and don't have the charm of their fellow countrymen. They overburden the songs as if they want to show it all in one song. The arrangements are done very well, but somehow the songs lack memorable elements. Perhaps it's their focus on guitar and keyboard... They try to offer a lot, but they overdo it. They offer a operatic metal duet with baritone Markus Nieminen. Anyway, the songs can't convince me and go up in smoke, I can't remember about most of the songs at all. To get to the level of Nightwish they have to do their homework, perhaps they should have spend more time on song writing... End Of Eden isn't a bad album, but it seems that the band is still searching for their own identity. Amberian Dawn should stop trying to be creative just for the sake of being creative and trust their feelings. End Of Eden I can only recommend to genre fans.